Massachusetts Congressional District 11 is an obsolete congressional district in eastern Massachusetts. It was eliminated in 1993 after the 1990 U.S. Census. Its last Congressman was Brian Donnelly; its most notable were John Quincy Adams following his term as president, eventual president John F. Kennedy and Speaker of the House Tip O'Neill. 1893: Suffolk County: Boston, Wards 21, 22. 23, 25. "Middlesex County: City of Newton, towns of Belmont, Holliston, Sherborn, and Water- town. Norfolk County: Towns of Bellingham, Brookline, Dedham, Dover, Foxboro, Franklin, Hyde Park, Medfield, Medway, Millis, Needham, Norfolk, Norwood, Sharon, Walpole, and Wrentham. Bristol County: Town of North Attleboro. Worcester County: Towns of Hopedale and Milford." 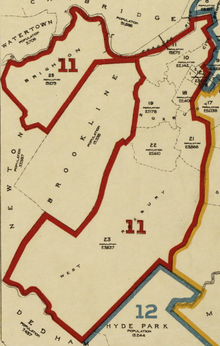 1916: Suffolk County: Boston Wards 10, 11 (Precincts 3, 4, 5, 6, 7, 8, 9), 12, 18, 19, 21, 22, 23. 1921: Boston (Wards 7, 8, 13, 14, 15, 16, 22, 23). 1941: Boston (Wards 1, 2, 3, 22), Cambridge, Somerville (Wards 1, 2, 3). 1968: "Norfolk County: City of Quincy. Towns of Avon, Braintree, Canton, Dedham, Holbrook, Milton, Norwood, Randolph, Sharon, Stoughton, and Weymouth. Plymouth County: City of Brockton. Suffolk County: City of Boston: Ward 18." 1977: "Norfolk County: City of Quincy. Towns of Avon, Braintree, Holbrook, Milton, Randolph, and Stoughton. Plymouth County: City of Brockton. Towns of Abington and Whitman. Suffolk County: City of Boston: Wards 15, 16, 17, 18." 1985: "Norfolk County: City of Quincy. Towns of Avon, Braintree, Holbrook, Milton, Randolph, and Weymouth. Plymouth County: City of Brockton. Towns of Abington, East Bridgewater, Rockland, West Bridgewater, and Whitman. Suffolk County: City of Boston: Wards 15, 16, 17, and 18." July 24, 1797 Newburyport Elected in 1795 on the third ballot. March 3, 1801 Essex County Elected August 4, 1797 to finish Bradbury's term and seated November 27, 1797. March 3, 1803 Hamilton Elected in 1800. July 16, 1810 [Data unknown/missing.] Elected in 1802. March 3, 1815 Leominster Elected to finish Stedman's term. Redistricted to the 12th district and retired. (now Northborough) Redistricted from the 10th district and re-elected in 1814. March 3, 1821 Uxbridge Elected August 26, 1816 to finish Brigham's term and seated December 2, 1816. March 3, 1823 [Data unknown/missing.] Elected in 1820. March 3, 1825 [Data unknown/missing.] Redistricted from the 8th district and re-elected in 1822. Redistricted to the 12th district. March 3, 1855 [Data unknown/missing.] Redistricted from the 7th district. March 3, 1875 [Data unknown/missing.] Redistricted from the 10th district. Resigned to become Asst. Secretary to the US Treasury Department. 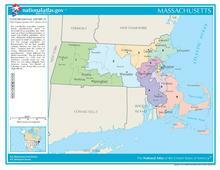 January 3, 1935 Boston Redistricted from the 10th district. Resigned to become chief justice of Superior Court of Massachusetts. January 3, 1979 Milton Redistricted from the 13th district. ^ Francis M. Cox (1893). "Massachusetts". Official Congressional Directory: Fifty-Third Congress (2nd ed.). Washington DC: Government Printing Office. ^ "Massachusetts". Official Congressional Directory: 64th Congress (2nd ed.). Washington DC: Government Printing Office. 1916. ^ a b "Massachusetts". Official Congressional Directory: 90th Congress. Washington DC: Government Printing Office. 1968. ^ "Massachusetts". 1985-1986 Official Congressional Directory: 99th Congress. Washington DC: Government Printing Office. 1985. ^ "Forth Congress March 4, 1797, to March 3, 1799". Office of the Historian, United States House of Representatives. Retrieved January 11, 2019 – via History.house.gov. ^ "Fourteenth Congress March 4, 1815 to March 3, 1817". Office of the Historian, United States House of Representatives. Retrieved January 11, 2019 – via History.house.gov. ^ "Massachusetts". Congressional Directory for the Second Session of the Thirty-Seventh Congress. Washington DC: House of Representatives. 1861. ^ Ben. Perley Poore (1878). "Massachusetts". Congressional Directory: 45th Congress (3rd ed.). Washington DC: Government Printing Office. ^ Ben. Perley Poore (1882). "Massachusetts". Congressional Directory: 47th Congress (3rd ed.). Washington DC: Government Printing Office. ^ L.A. Coolidge (1897). "Massachusetts". Official Congressional Directory: Fifty-Fifth Congress. Washington DC: Government Printing Office. ^ A.J. Halford (1909). "Massachusetts". Congressional Directory: 60th Congress (2nd ed.). Washington DC: Government Printing Office. ^ "Massachusetts". Official Congressional Directory: 75th Congress (2nd ed.). Washington DC: Government Printing Office. 1938. ^ "Massachusetts". 1991-1992 Official Congressional Directory: 102nd Congress. Washington DC: Government Printing Office. 1991. Wikimedia Commons has media related to Massachusetts's 11th congressional district.